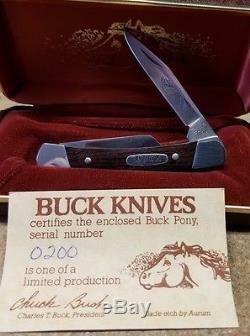 My dad retired in 1981, after 20+ years of service, as the vice president of Buck Knives. He passed a few years back. I, his son, have decided to offer his personal collection of vintage items. Included here are four knives with matching serial numbers, go back and re read that, I'll let that one sink in a moment. Included in this set is the Mustang, Colt and Pony with etched blades and presentation boxes and the bicentennial knife celebrating our country's 200th year. All four have the serial number 200. That's right, the knife celebrating our 200th anniversary is serial number 200! All are in pristine condition. Also there are two kitchen sets, the Buck Moderne and and the Empress Trio still sealed in it's original shrink wrap. 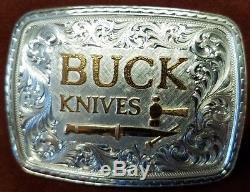 There is a sterling silver BUCK belt buckle serial #59 and a 70's vintage BUCK Knives old Knife and Bolt logo sew on patch. There is a never used BUCK NEMO. There are a pair of his personal Buck Knife Tie Tac's One is a 60's version with the knife and bolt logo and the other is a 70's model 110. 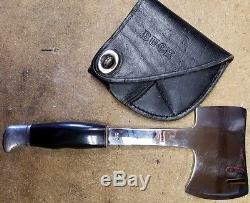 There is also a 60's Buck Axe #106. 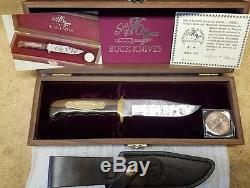 The pair of early 70's BUCK Cactus Handle Steak Knives are no longer part of this listing. 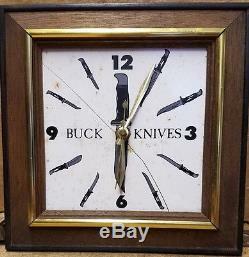 Lastly, there is the BUCK Clock that hung in his office. I plugged it in and it still works. The tile face is cracked. Well, there you have it, a collection like non other! 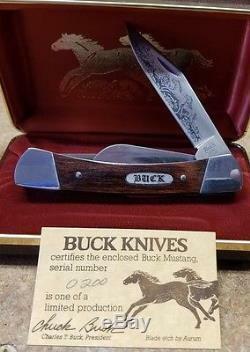 You have the chance to own well over a dozen pieces of Buck Knife memorabilia. If you have any questions. Prior to your order as I would love to speak with anyone interested in this listing. 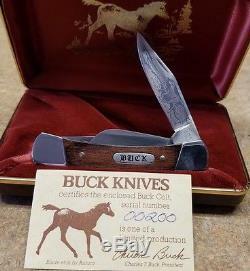 The item "Amazing Opportunity for this ONE OF A KIND Collection of Buck Knives Memorabilia" is in sale since Tuesday, November 27, 2018. 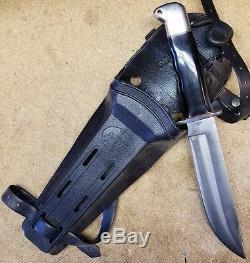 This item is in the category "Collectibles\Knives, Swords & Blades\Collectible Folding Knives\Mixed Lots". The seller is "tuckerstreasures205" and is located in Rio Rancho, New Mexico. This item can be shipped to United States.